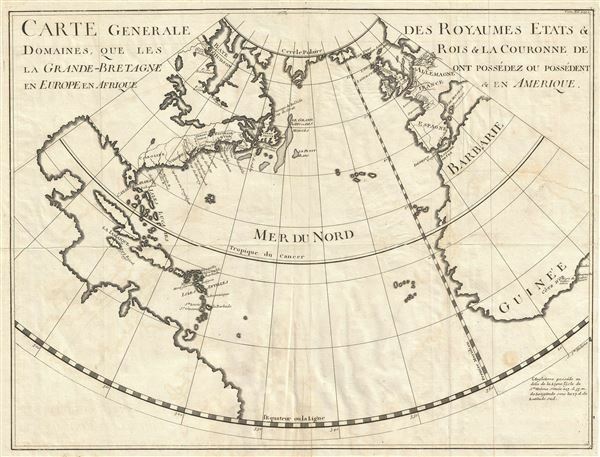 Carte Generale des Royaumes, Etats and Domaines, Que les Rois and La Couronne de La Grande Bretagne ont Possedez ou Possedent en Europe en Afrique and En Amerique. An unusual c. 1724 map showing English dominions in the New World, Europe, and Africa. This map was published for Paul Rapin de Thoyras's L'Histoire d'Angleterre. Covering from the Polar Circle to the Equator and from the Gulf of Mexico to the Mediterranean, this map reveals English claims as of and up to 1724 - early in Britain's most active period of aggressive global expansion. These include various named colonies in the New World as they existed prior to the French and Indian War. In Europe claims to parts of France and Holland are recognized. So too are various claims in Africa and the West Indies. Rapin de Thoyras's L'Histoire d'Angleterre is better known in its English translation as prepared by Tindal. Rapin de Thoyras, P., L'Histoire d'Angleterre (Hague: Durand and Dupard) 1724. Very good. Original fold lines. Right margin narrow. Original pressmark visible. Blank on verso.